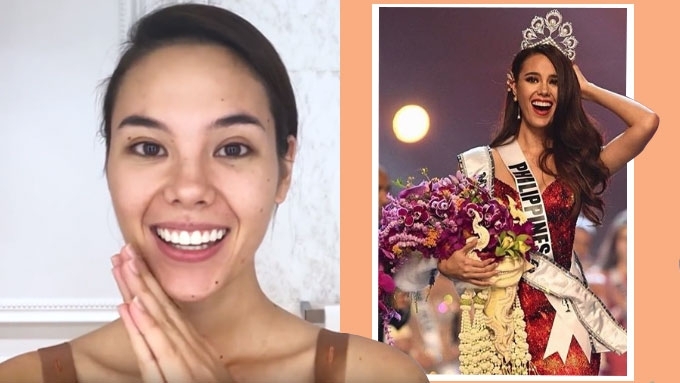 Miss Universe 2018 Catriona Gray recreates coronation makeup for Vogue's Beauty Secrets video series. Miss Universe 2018 Catriona Gray headlines Vogue's latest Beauty Secrets video special. The Filipino-Australian beauty queen recreated her makeup look from the grand pageant's coronation night last December 17, 2018, in Bangkok, Thailand. In the article, Vogue described Catriona's pageant makeup style as having a "maximalist approach." Her process appeared "unapologetically labor intensive" with the layers of beauty products applied on her face, but it "yields a surprisingly subtle result—until she puts her lipstick on." For the Miss Universe 2018 competition, Catriona did her own makeup and hair for her stage presentations. Celebrity makeup artist Jelly Eugenio and celebrity hairstylist Brent Sales were among her pageant mentors.